There's a chaotic dance going on at the far end of our solar system, involving Pluto and five of its closest friends, a new study finds. 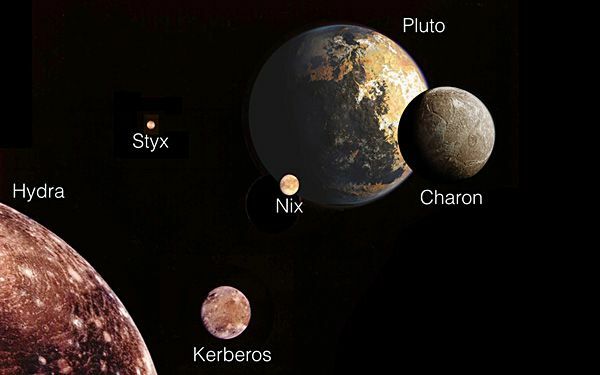 Hubble Space Telescope images of Pluto, its largest moon Charon and tinier moons Styx, Nix, Hydra and Kerberos show the odd rhythmic gyrations of the six distant objects in a dance unlike anything in our solar system. What makes it so odd is that there's a double set of dances going on. 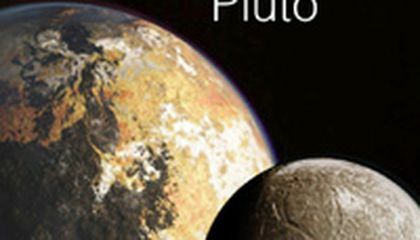 First, Pluto and Charon are locked together in their own waltz "as if they are a dumbbell" with a rod connecting them, said study author Mark Showalter of the SETI Institute in California. It's the solar system's only binary planet system, even though Charon isn't technically a planet, he said. Pluto, too, is no longer considered a full planet. But Pluto and Charon aren't alone and that's where it gets more complicated. The four little moons circle the Pluto-Charon combo, wobbling a bit when they go closer to either Pluto or Charon, being pushed and pulled by the two bigger objects. Those four moons orbit Pluto-Charon in a precise rhythmic way, but with a twist: They also interact when they near each other. So it seems like they all dance to one overarching beat but not quite in the same way, just doing their own thing, said planetary scientist Heidi Hammel of the Association of Universities for Research in Astronomy. "It's kind of like you'd see at a Grateful Dead concert," Hammel said. She wasn't part of the study, but praised it as giving a glimpse of what might be happening in other distant star systems where there are two stars and planets that revolve around them, like the mythical Star Wars world of Tatooine. With the tiny moons wobbling and flipping over in an unpredictable and chaotic way, if you lived on Nix or Hydra, the sun would come up in different parts of the sky, if at all on some days, Showalter said. NASA's $700 million New Horizons spacecraft will arrive in the Pluto system in mid-July after a nine-year 3 billion mile flight that started before Pluto was demoted to dwarf-planet status. Pluto and its moons Charon, Styx, Nix, Hydra and Kerberos are engaged in a dance around each other. Charon and Pluto revolve around each other as if they were wheels with an axle between them, the only binary planet system in the solar system. The smaller moons orbit both Pluto and Charon, wobbling in their orbits when they near the bigger objects. NASA's spacecraft, launched in 2006, will be reaching Pluto-Charon in mid-July and provide us with the first up-close pictures of Pluto and Charon. I think the $700 million price tag of the New Horizons craft is cheap compared with the billions spent on others, and I'm excited to see what the dwarf planet looks like. It is called a dance because its like art. and thats what dance is. Pluto Is a planet its in the news like one. Why can't it be, just let it be. So yes these moons are dancing around this planet called Pluto and it looks cool because how much there is and the movement. this is awsome. this story is an awsome thing to read about. this is a great story. i would love to read more storys like this. First i will answer the question: I think it is so called because the objects orbit around Pluto, also they are rotating in a very precise rhythmic way, which resembles a dance. And I think that seems a kind of dance. Now I have the confusion of whether or not Pluto is a planet, the other time was told that was not a planet, then, it was, but anyway; I think the space is amazing, always are discovering new things in the galaxy, and the many things there. Good to know that technological advances continue investigating the space as technological advances now it is easier to do, and serves all people to know about it. Is fun to know that there are more moons than I know, it makes me think it is great and infinite space. Astronomers are very fortunate to know more about space, it is a very beautiful profession.